trackscotland.co.uk :: View topic - 15% off Millers Nanodrive NT+ Top 3! Wed Apr 12, 2017 9:43 am Post subject: 15% off Millers Nanodrive NT+ Top 3! So, we've had a lot of interest and a huge amount of positive feedback on Millers Oils new and improved Nanodrive NT+ range of motorsport oils since their launch. We've also noticed a fair few of you crying out for us to run an offer on them, and like the benevolent people that we are at Opies, we listened. 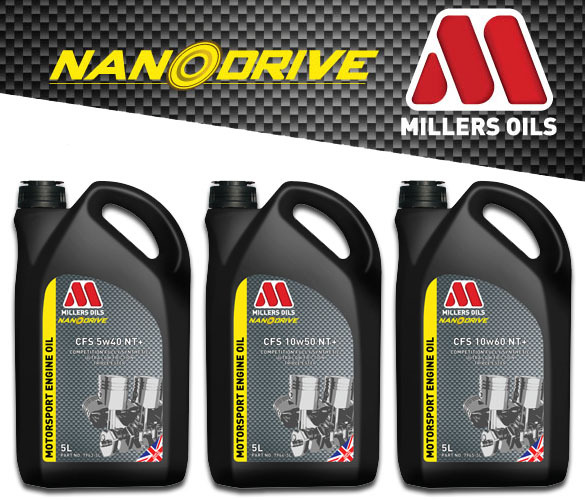 We are pleased to announce that we will be offering 15% off the top 3 Millers Nanodrive CFS NT+ Oils! All you need to do is enter the code: NANO15 at checkout to get 15% off. To clarify, this offer is for Millers top of the range CFS NT+ oils, not their standard CFS motorsport oils. This will be running for a limited time only, so make sure you get those orders in quick! This discount cannot be used on trade orders. Millers Oils range of NANODRIVE NT+ oils are getting some stellar reviews, and it's no surprise thanks to their new and improved ultra low friction additive package. Proven to reduce engine friction by a further 15% over and above their previous multi-award winning products, this sets them apart from the competition, providing increased levels of power and torque that are immediately noticable. Simply put, the NT+ range has been developed from the ground up to offer the highest levels of protection and improved efficiency for high performance engines. With free shipping to Mainland UK on orders over �60, it's a great time to get serviced and prepped in time for summer, with track days and events of all sorts looming. If you need any other servicing parts, from filters, spark plugs and wiper blades, to gearbox oils and brake fluids, we've got you covered. Wednesday April 12th - Normal deliveries. orders placed on this day with priority service selected will be delivered on Thursday 13th, orders placed with standard or free shipping selected will be delivered by Wednesday 19th. Thursday April 13th - Normal deliveries. Orders placed on this day with priority service selected will be delivered on Tuesday 18th, orders placed with standard or free shipping selected will be delivered by Thursday 20th. Friday April 14th - No deliveries. Saturday April 15th - No deliveries. Sunday Aprl 16th - No deliveries. Monday April 17th - No deliveries. Tuesday April 18th - Normal deliveries. Orders placed on this day with priority service selected will be delivered on Wednesday 19th, orders placed with standard or free shipping selected will be delivered by Thursday 21st. Until next time, HAPPY EASTER!